NDnano is now accepting applications for the Center’s summer 2017 NDnano Undergraduate Research Fellowship (NURF) program. 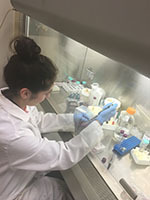 Current freshmen, sophomores, and juniors from any university in the U.S. or abroad are welcome to apply to the nearly 30 projects offered by science and engineering faculty affiliated with the Center. The positions are full-time for 10 weeks. During the course of the summer, fellowship recipients will be part of Notre Dame’s summer research community. In addition to hands-on research, student in the program will have the opportunity to participate in a variety of social and professional development activities. More than 170 students from around the world have participated in the NDnano program since its inception. The application deadline is 8:00 am (Eastern) on Monday, February 13, 2017. Feel free to direct questions not addressed in our FAQ to Heidi Deethardt at ndnano@nd.edu or 574-631-0279. Originally published by Heidi Deethardt at nano.nd.edu on December 16, 2016.